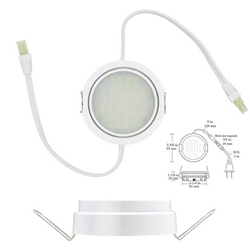 120V Plug-in or hardwire high output puck style fixtures. No external power supply required! Each unit is self-driven with a replaceable 3W head (bulb). Recess or surface mounted and jumping over/around obstacles is made easy with accessory link cords. Fixtures are dimmable by standard LED wall dimmers. Several finishes and color temperatures available. 25,000 end of life hours. 3-1/4” (83 mm) hole required for recessing. Trim Kit is included with each Light Body, which is required when mounting the light to a surface. All Pockit® lights can be either surface mounted or recess mounted.